796.93 RPG: What is an RPG? I will admit, I am one of the people that Annoyed has mentioned in her "Retooling the Library" post. That is, I am someone who has a hobby that I enjoy, and wish to share with other people, and I believe the library can help with this. That being said, I would like to see this happen in the context of the library's mission: to provide education (and to a lesser degree, entertainment) to the public. Gaming and libraries seem to be a good fit, if the amount of use my local branch's Wii gets is any indication. Could role-playing games and libraries be a good fit as well? Even better, could role-playing games end up supporting libraries and increasing library use? “Role-playing games are fundamentally different from most other types of games in that they stress social interaction and collaboration, whereas board games, card games and sports emphasize competition.” -Wikipedia. The definitions from Dictionary.com and wikipedia are decent, and even the Urbandictionary definition has a bit of truth to it. Let's look at the parts of the definitions a bit closer. RPGs are games. It is supposed to be fun. Like any game, there are rules and participants. And like different board games, card games and sports, the rules change depending on what the game is. Some of the rules are complicated, while others are not. But they are supposed to be fun. This is the part of every RPG book that has ever been written that says “it's sort of like when you played Cops and Robbers as a kid.” The players pretend to be someone (or something) that they are not. That “something” can be as far from their normal daily life as they would like. Want to be a vampire? Done. How about a private detective? Can do. Alien? Barbarian? Superwoman? Yes, yes and yes! Like putting on a costume at Halloween, the being something you're not is part of the fun. But unlike the costume-clad-holiday, you actually get to do things that are in keeping with the character you are portraying, in your imagination. Now, the word “adventure” can mean anything other than your usual day-to-day life. Pretending you are exploring a dungeon full of monsters is an adventure. So is tracking down the bad-guys by following clues and interviewing suspects. So is saving your adopted planet from an invading force. But we can go beyond those obvious, action-filled scenarios. Going to a new school (witches and wizards optional) could be a good adventure, if there was an appropriate plot. Anything that would make a good story could, potentially, make a good adventure. But adventures that have a fair amount of action, physical exploration and mystery seem to be the norm for RPGs, so that is what we will focus on for the first part of this blog. Most participants play only one character, but one person plays multiple characters... and other things. That person, usually referred to as the game master, responsible for the plot, setting and some of the characters, including the antagonists. Furthermore, the game master interprets how the character's actions effect the over-all plot of the adventure. This includes making decisions about how the actions and the rules interact. Just wanted to point out that Vin Diesel is an avid gamer (Adler). The last thing I would call Vin Diesal is a nerd! Me? Sure, I'm a nerd. Not Vin Diesel. This is partly true. Yes, there are many games that are rules-heavy. They have rules for just about everything you could think of, and quite a lot you couldn't. (One friend said he could have used a source-book from Shadowrun to learn university level economics; another said that the rules for vehicle stress/speed/towing capacity was tested and found to be accurate in real-life.) While others have very few rules and are more free-form. Usually, the characters in the game will have different sets of abilities and skills. They could compliment each other, or be completely different. It is by using these different skills and abilities together that a group will successfully finish an adventure. The game master also takes part in this collaboration by setting up adventures, providing accurate information, making fair rulings, and ensuring the game flows. So, what is an RPG? It's a social game, where people have fun by creating a narrative through the portrayal of imaginary characters on an “adventure”, constrained by a set of rules and officiated by an individual who controls the plot, setting and minor characters. In my next few blogs, I will outline some reasons why The traditional pencil-and-paper RPG, one that involves books and socializing with friends and many dice rolls, is a form of entertainment that librarians should support as a means to help their patrons. Dictionary.com "Role Playing Game" http://dictionary.reference.com/browse/role+playing+game Accessed on April 2, 2011. 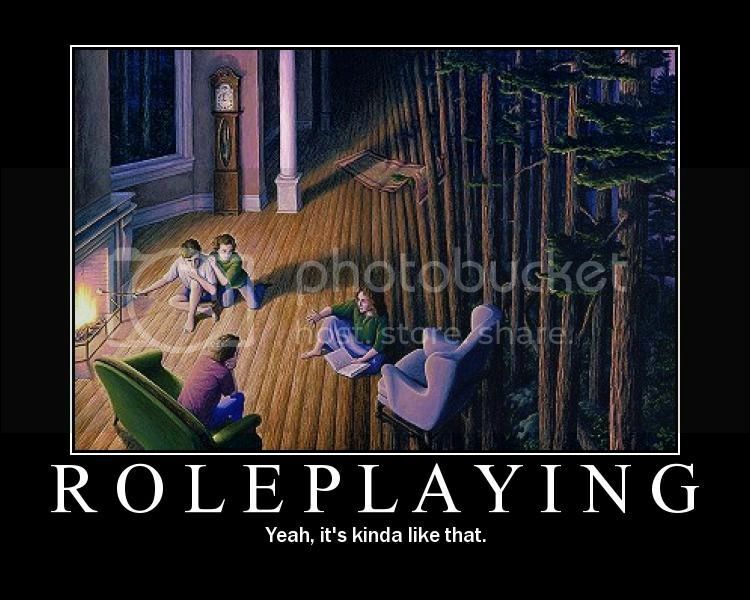 Wikipedia.com "Role Playing Game" http://en.wikipedia.org/wiki/Role_playing_game Accessed on April 2, 2011. UrbanDictionary.com "Role Playing Game" http://www.urbandictionary.com/define.php?term=Role%20Playing&defid=3300391 Accessed on April 2, 2011. Adler, S. "Vin Disel of the Chronicles of Riddic Interview". UGO Entertainment. http://www.ugo.com/channels/filmTv/features/thechroniclesofriddick/vindiesel.asp Accessed on April 2, 2011. Dextar's Lab, Season 2, episode 3: “D & DD”. July 30, 1995.